Anxiety lies at the heart of the Watergate affair. 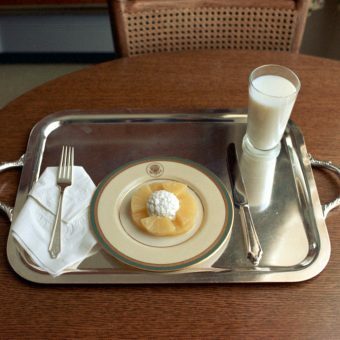 Could the Richard Nixon administration restore the people’s faith in a system of Government exposed and found wanting? Could the people distinguish between the system and the abuse of it? When on June 17, 1972 five burglars were caught wiretapping the DNC headquarters at the Watergate complex, the US threatened to unravel. Power failed. 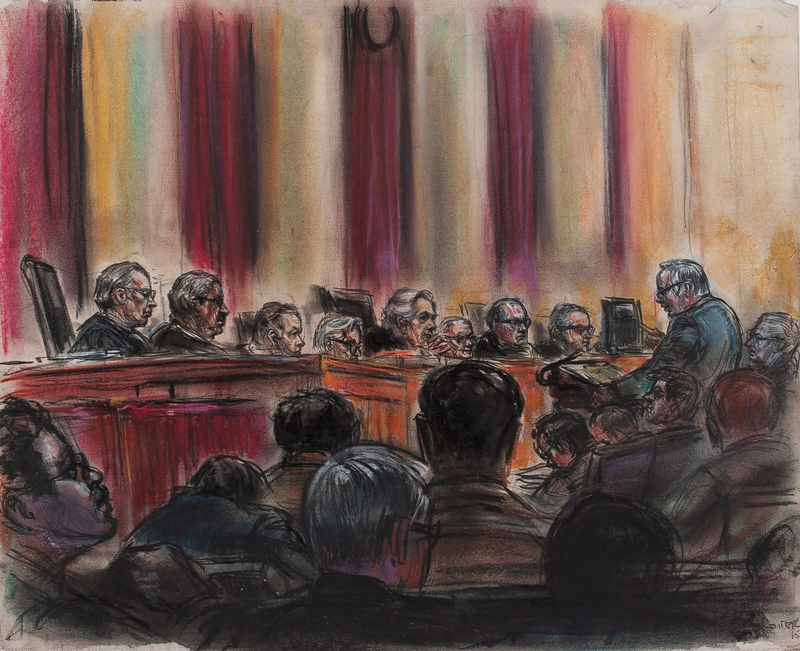 The media and the judiciary were there to define and test the proper balance of authority. The Washington Post and other newspapers tied the burglary to Nixon’s White House. The Republican president was on the verge of impeachment. Nixon denied it all. He called it a crude a ludicrous plot properly punished when the thieves were tried and jailed. The paper dug and kept digging. Nixon accused the Washington Post of “innuendo” and “huge scare headlines which the Post knew to be false”. The Post knew it was right. Nixon told the people he hoped he was “worthy of your trust”. But men at the top of the White House hierarchy were culpable. Former Attorney General John Mitchell, former White House Chief of Staff H.R. 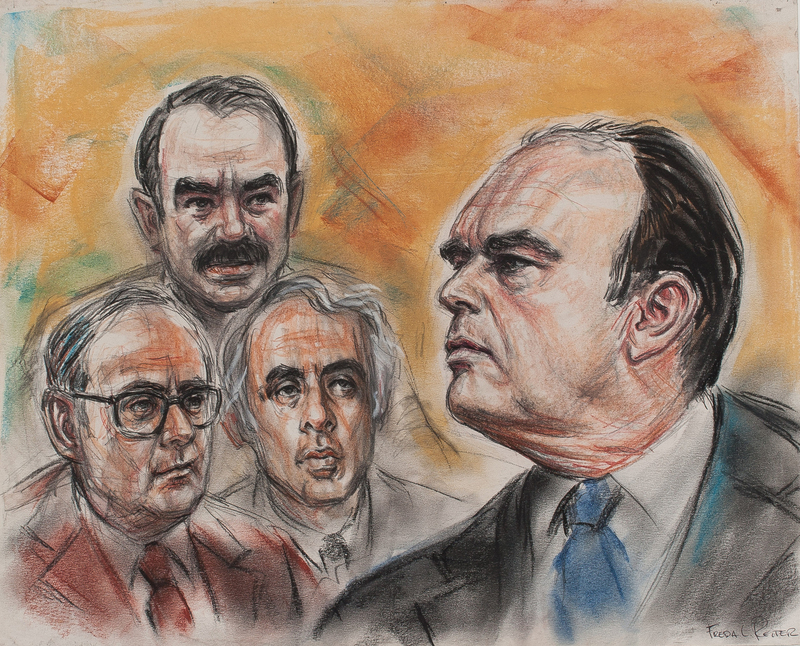 Haldeman, and former White House counsel John Ehrlichman were sent to prison. 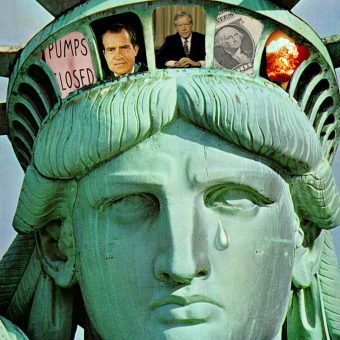 The US Constitution was set up to anticipate for mankind’s greed, dishonesty, frailties and propensity for tyranny. If the President is thought by any number of Congressmen to have betrayed his office through high crimes and misdemeanours he can be impeached. The House of Reprensentatives, the Lower House, acts as the Grand Jury. 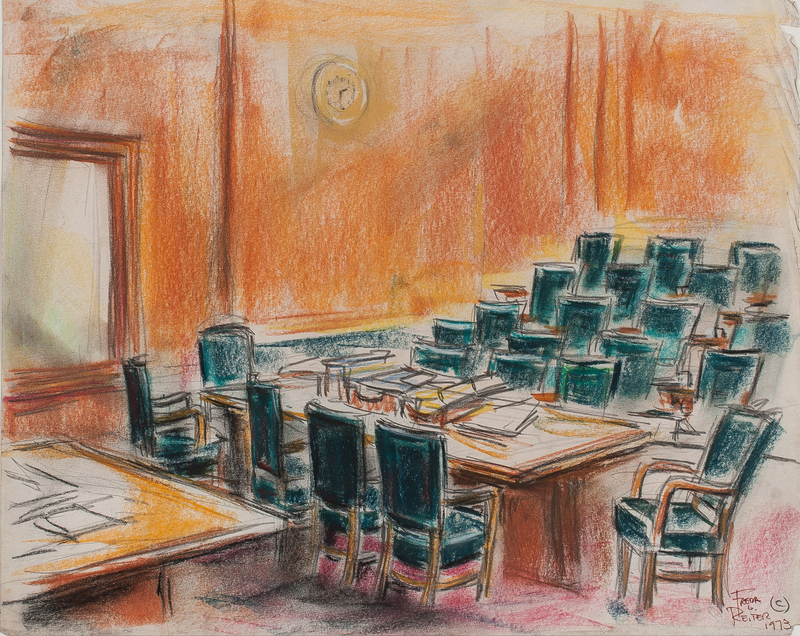 If it decides there is a case by majority vote, the Senate, the Upper House, is called upon to sit as a trial court. If it votes to find a crime by a two thirds majority, the President is pronounced guilty and sacked. The process is not fast. 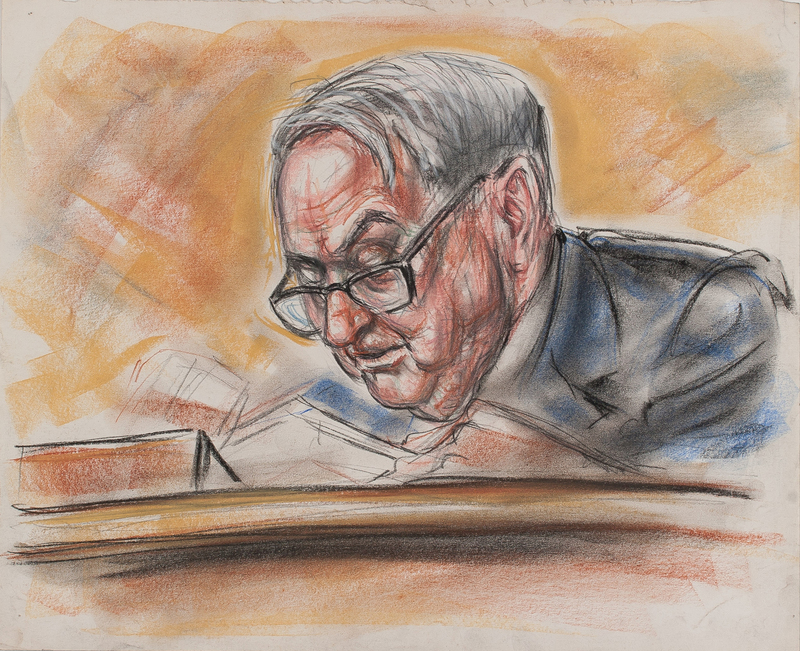 But in 1973 and 1974, members of Richard Nixon’s administration went on trial, and the phrase “Watergate” became shorthand for a many-layered political scandal. 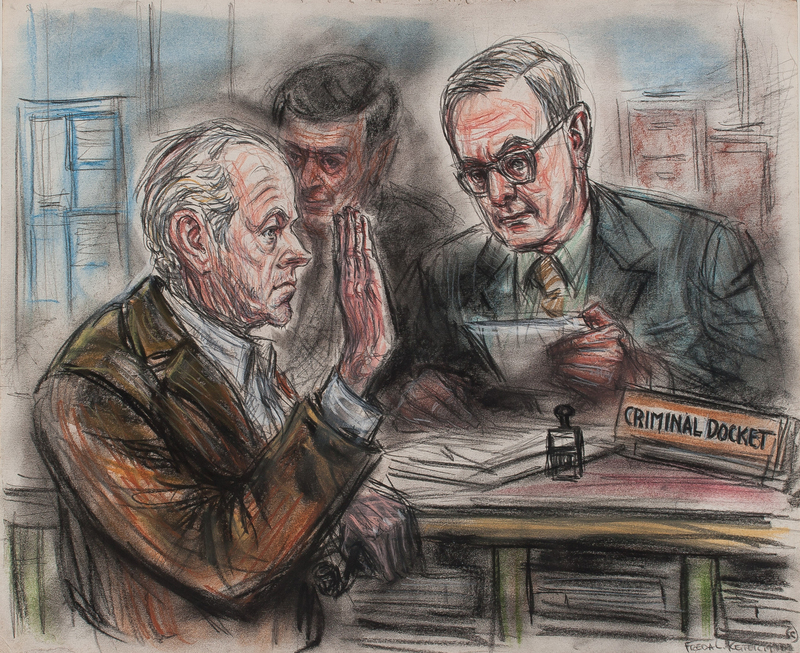 Artist Freda L. Reiter (1919–1986) captured the drama in pastel drawings broadcast on ABC-TV: courtroom scenes drawn from life, as well as visual recreations of Nixon’s tape-recorded conversations, and even of the moment he resigned from the presidency. The Senate hearings broadcast live in spring 1973 drew record ratings. 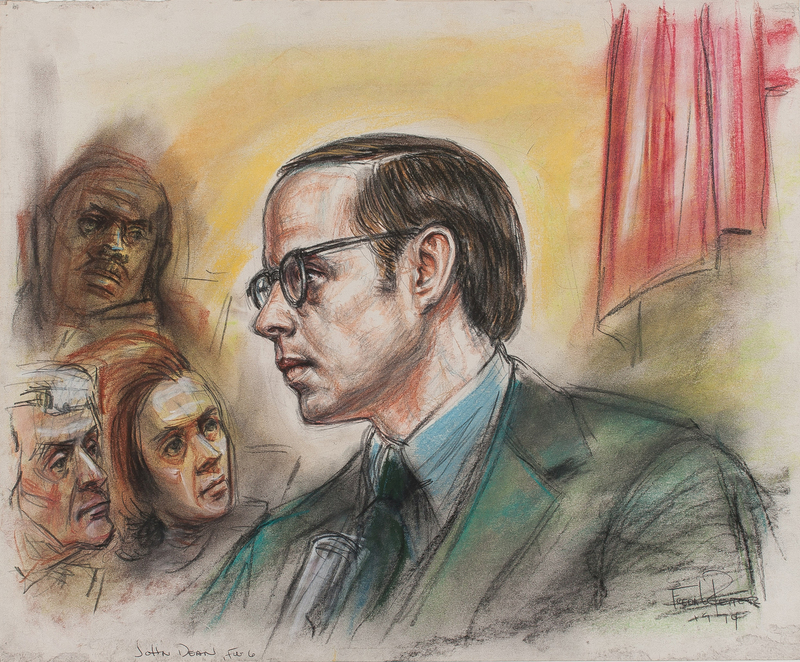 Nightly news shows covered the multiple trials that led to Nixon’s resignation on August 8, 1974, and finally to the conviction of several of his top aides on New Year’s Day 1975. 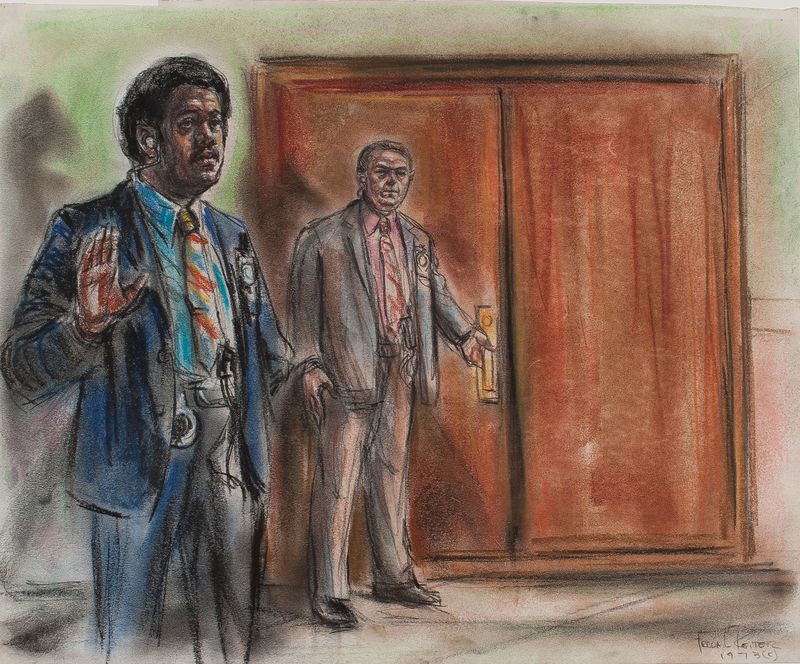 Since cameras were banned from courtrooms, news outlets depended on professional sketch artists like Reiter for visuals. 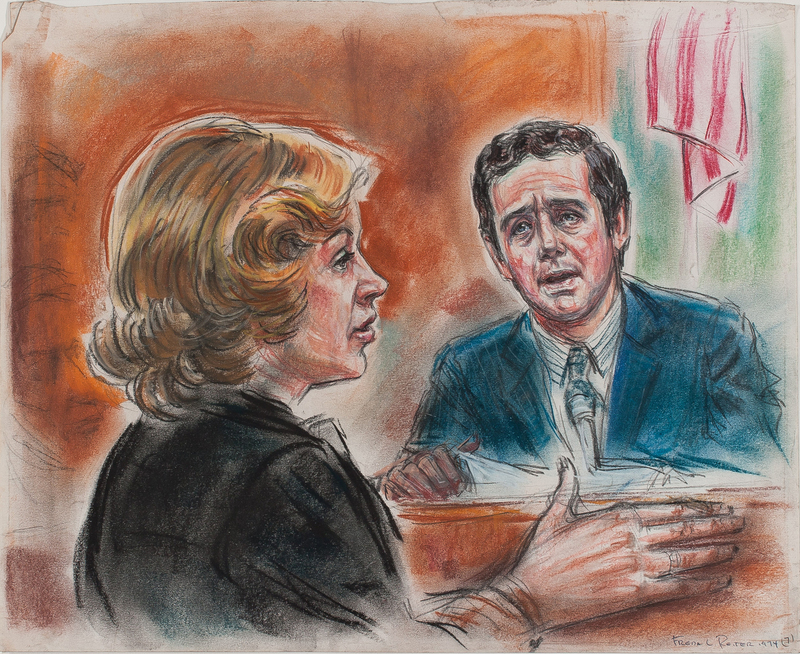 When Reiter was assigned the Watergate burglary trial, in 1973, she had no idea that she would be spending the better part of two years in Washington. 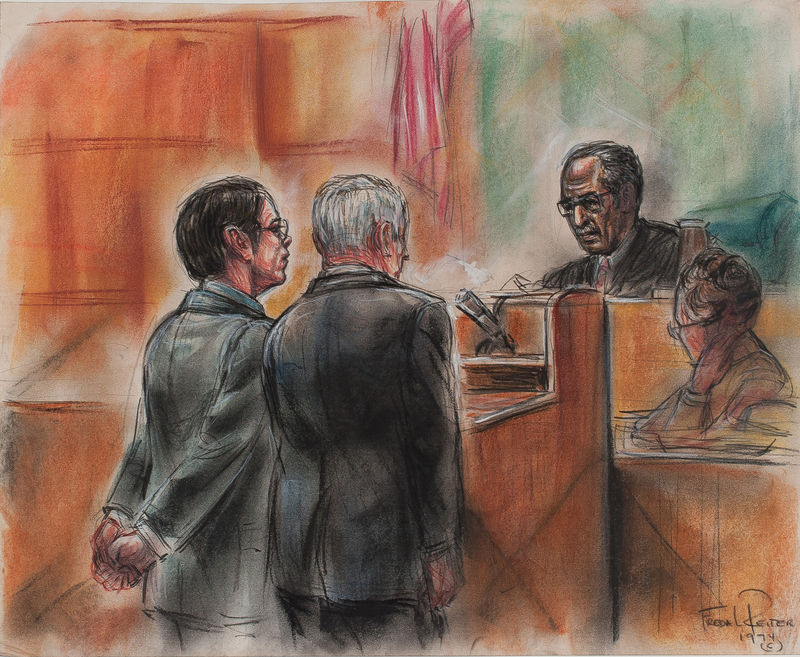 As the story deepened, Reiter covered all the trials and hearings. 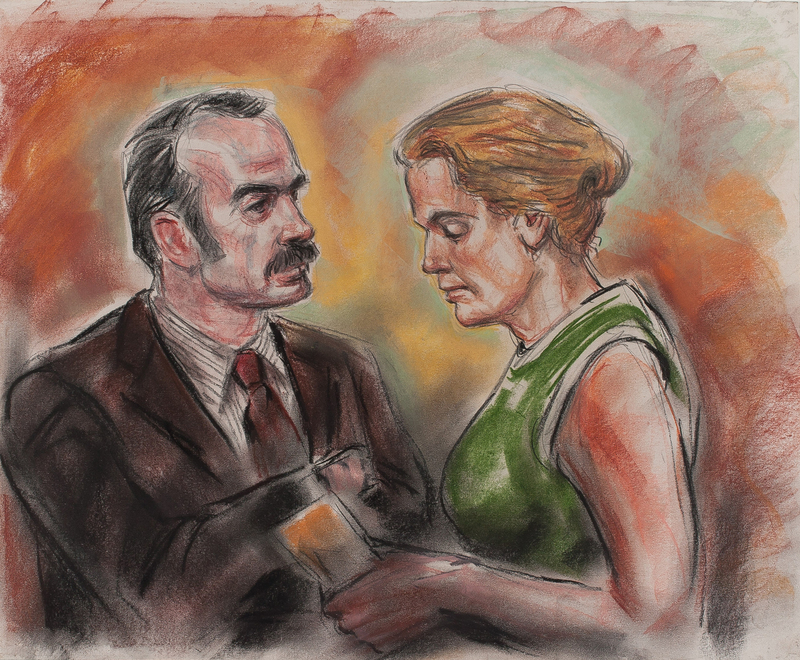 To provide sufficient visuals for the substantial airtime allotted to the story each night, she made multiple sketches a day: close-up portraits, as well as wide-angle views of the courtroom incorporating as many as 28 figures. 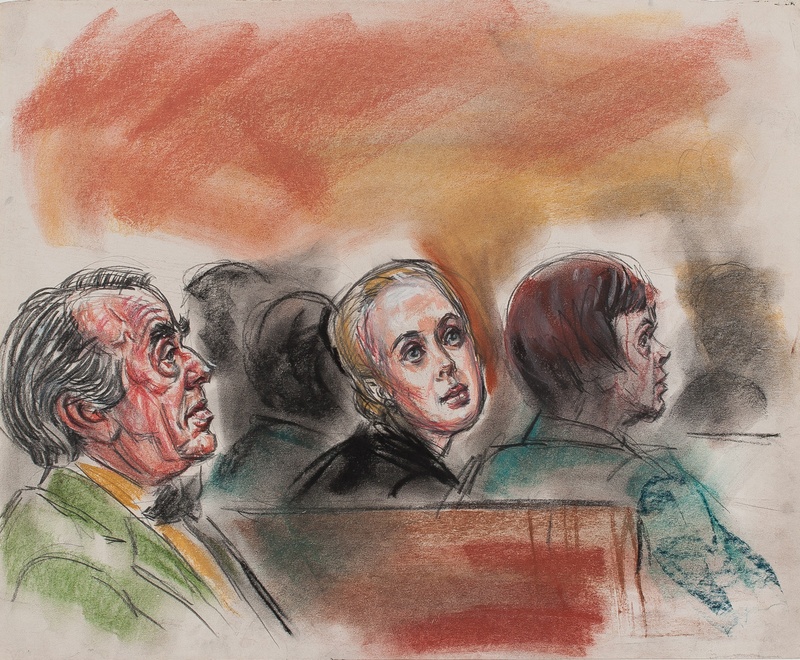 Reiter’s eye for facial expressions and gestures helped her capture the personalities of key figures, just as her impressionistic use of color conveyed the heightened mood in the courtroom. 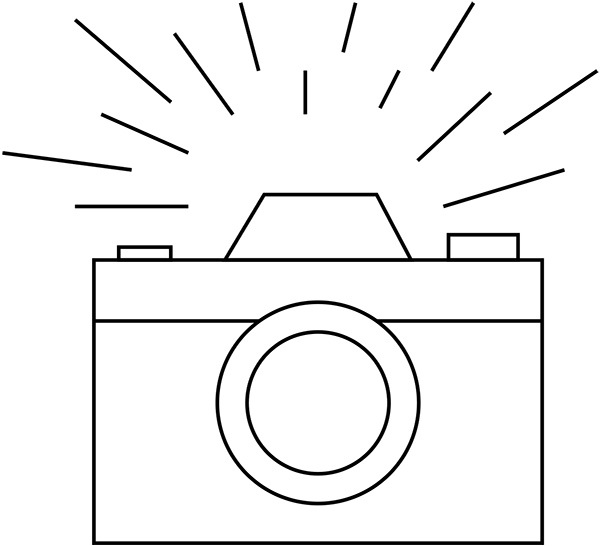 Despite the pretense of objectivity, Reiter’s sketches betray a point of view. 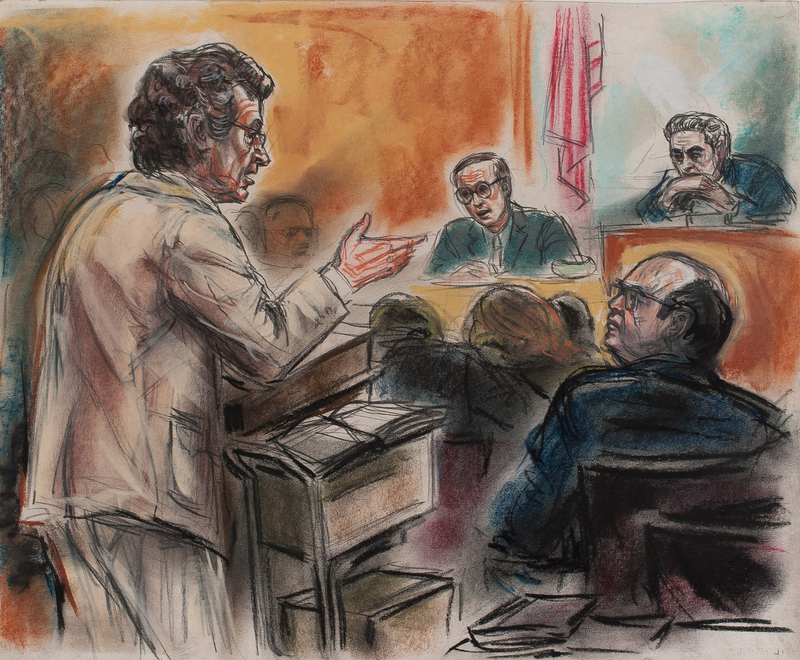 As the prosecution closed in, and Nixon’s approval rating continued to sink, the trials took the form of a suspenseful television drama, with its heroes and villains. 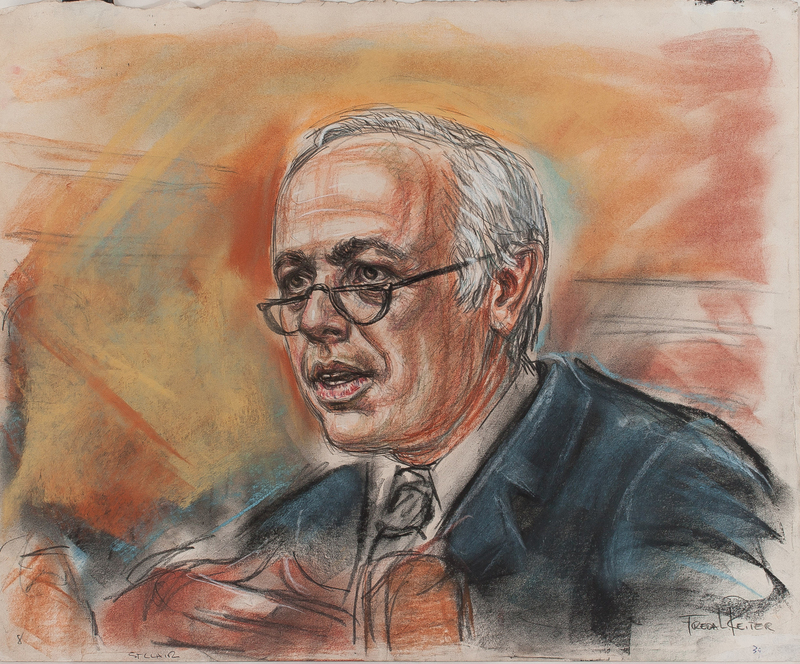 One need only compare Reiter’s depictions of prosecution witness John Dean (youthful and stoic) and defendant John Ehrlichman (wrinkled and snarling) to see her stance on the proceedings. 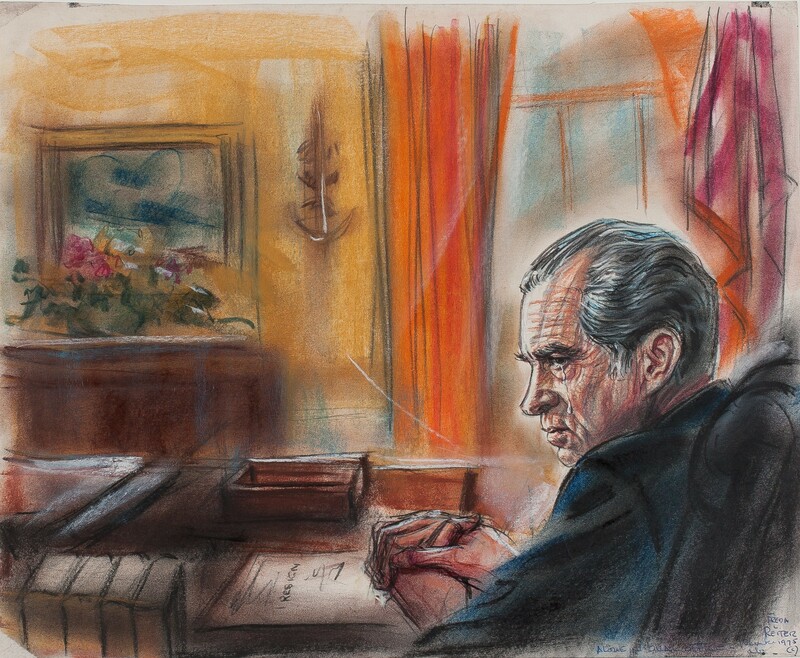 At the heart of the Watergate scandal were Nixon’s secret audiotapes, first revealed during the Senate hearings, and only released after the Supreme Court’s ruling, in United States vs. Nixon, against the President’s claim of executive privilege. 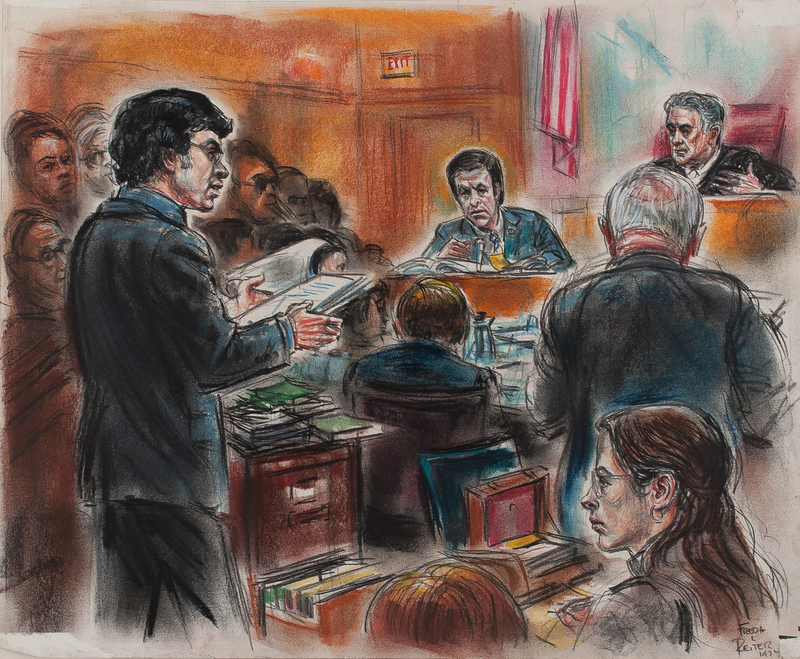 Several of Reiter’s courtroom sketches depict defendants listening to the declassified tapes on headphones. 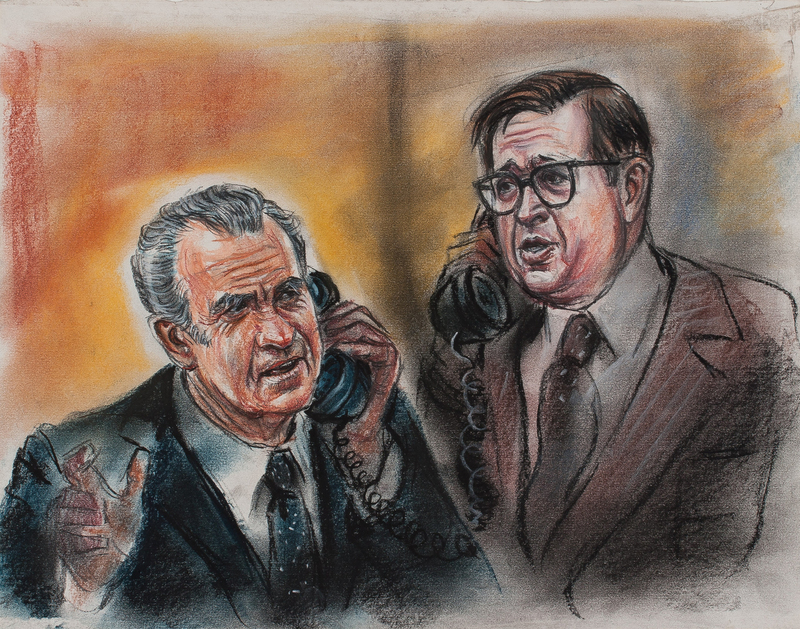 To accompany the tapes’ playback on TV, Reiter also re-created the scenes of their recording, drawing her own envisions of Nixon’s Oval Office meetings. Reiter’s drawings continue a long tradition of journalistic illustration, which was generally excluded from the mainstream art discourse. 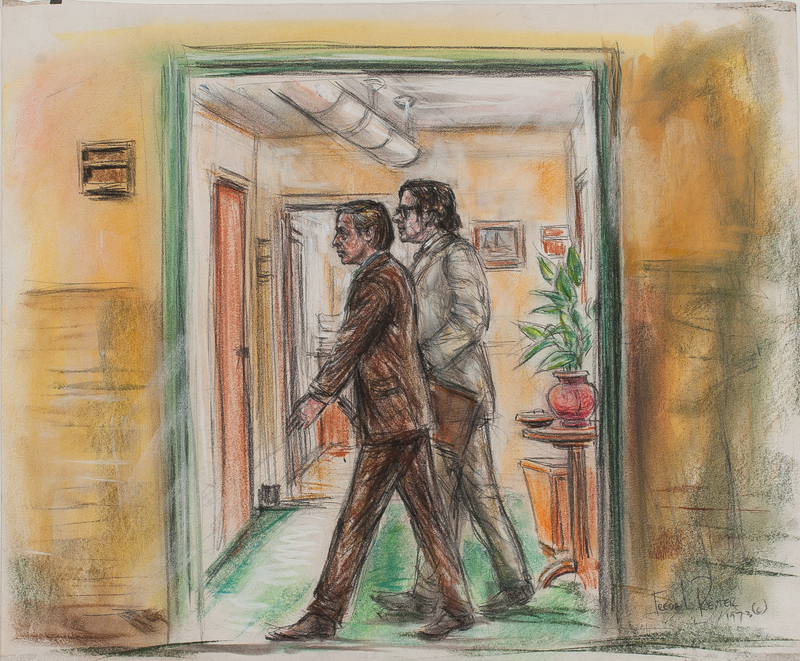 Watergate Courtroom Sketches by Freda L. Reiter, 1973–75 at Gallery 98 in New York.